Despite the wonderful insights on minority literatures developed in these studies, single-authored monographs on non-Han literatures are severely lacking in our field, and Chinese literary studies in the U.S. as a whole seems to be dominated by a Han-focused perspective. 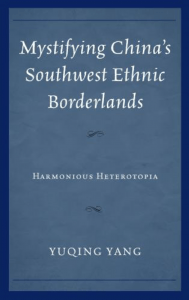 Yuqing Yang’s 2018 monograph, Mystifying China’s Southwest Ethnic Borderlands: Harmonious Heterotopia contributes to enriching the research on Chinese shaoshu minzuliteratures. An ethnic Bai scholar trained at the University of Oregon and currently teaching at Minzu University of China, Yang charts the cultural myths and fantasies surrounding three minority regions in southwest China, revealing an entanglement between representation and reality—“textual and extratextual formats”—in the making of the Bai, Mosuo, and Tibetan identities in reform-era China (227). The book builds on the Foucauldian notion of “heterotopia” and the Confucian ideology of “harmonious society” to develop an original theory of “harmonious heterotopia” in its conceptualization of minority-related literary and cultural phenomena in contemporary China. In the introduction, Yang engages with a few pairs of seemingly contradictory concepts to make sense of how minority regions and identities are imagined in China. Simultaneously mystified as cultural paradises and lamented as “barrier[s] to modern development” by mainstream Chinese society, minority regions, peoples, and traditions are, for Yang, heterotopias that possess “complex and even incompatible” meanings in their ability to “mirror” the utopian visions of socialism and Confucian ideology (4, 12, 14, 15). Yang’s discussion throughout employs the thematic trope of “myth” or mythology to analyze the (imagined) identities of Bai, Mosuo, and Tibetan peoples and cultures. Rooted in the Confucian search for a harmonious society (大同社会) and the socialist zeal for discovering harmony despite difference in the non-Han regions, the three minority cultural sites are, in the author’s words, places where “mythology and ideology are intertwined” to produce knowledge about shaoshu minzu(16). The book is divided into three parts, each comprised of three chapters. Each part addresses a specific minority culture and all admirably combine studies of both Han- and minority-produced texts to unveil how a particular minority identity is constructed. Part I, “When the Past is Present,” examines how the Bai identity is reconstituted in Dali, Yunnan province. This part centers on how ancient folklore, local legends, and myths from the Bai tradition are reworked to construct the Bai identity. Particularly, the history of the ancient Nanzhao Kingdom (南诏国) in Yunnan and its relationship to dynastic Chinese rule is discussed in detail in chapter 1. Surveying accounts by Han and Western scholars on the origin and history of the Bai, Yang suggests that the writing of Bai history is subsumed under the official ideology of “harmony,” where concepts of ethnic “assimilation” and “amalgamation” hold sway and a “de-familiarizing gaze” subjects the Bai to the Han-centric aspiration of a “heterogenous Chinese culture” (40). Part I also traces how certain local myths and legends, such as the story of Baijie (白洁 or 白姐), the Holy Consort and symbol of maternal power in the Bai tradition, help minority people imagine their identity by functioning as cultural “mobilizers” in various textual and performative forms. Yang elaborates on the modern and contemporary adaptations and re-creations of the Baijie/holy mother legend, including its dramatic incarnations in various local and national operas. By doing so, Yang reveals the generative power of folkoric tropes in revitalizing a local minority tradition. Chapter 3 furthers this line of thought by discussing how the Bai female writer Jing Yi reworks the legend of Baijie into her fiction. Here, Yang adopts a feminist perspective to inquire into the constitution of the ethnic subject: she probes how the multivalent, embodied experience of the ethnic woman defies the definition of the minority as the essentialized other. Yang marshals a rich array of texts to examine how Jing Yi deploys an “idiosyncratic way of regarding herself as a Bai woman” in her fictional re-creations of Bai legends (79). Perhaps attributable to Yang’s own background as a minority female scholar, gender becomes a recurring thematic focal point, especially in later chapters of the book. Part II moves geographically from Yunnan proper to the Yunnan-Sichuan borderland of Lugu Lake (泸沽湖), site of a matrilineal society that has been labeled the “Country of Women” (女儿国) in the Chinese popular imagination. The three chapters in this part analyze how the Mosuo people (摩梭人) residing on the shores of Lugu Lake and their matriarchal traditions are romanticized in sociological, fictional, and mass cultural productions by both Han and Mosuo intellectuals. The Mosuo people, although never granted an official minzu (ethnic minority group) status by the Chinese state, have nevertheless captured the imagination of many Han cultural scholars and sociologists for their perceived exoticism. The distinctive matrimonial practices of tisese ( “walking marriage,” or 走婚 in Chinese) and unique gender norms of the Mosuo never fail to fascinate Han scholars and writers. Chapter 4 surveys the sociological literature produced by Han scholars and the inherent moralizing tendency in their investigations of Mosuo culture, typified in the discourses surrounding tisese. Though at times fantasized as a paradise of gender equality and sexual harmony, the Mosuo society and its marriage practices are sometimes condemned for encouraging “illicit and abnormal relationships” by a Han cultural “center” that upholds a Marxist ideology of civilizational stages (108). Chapter 4 brings to light these moralizing discourses as well as controversies in Han scholars’ characterization and representation of Mosuo culture, presenting the sociological accounts and intertextual debates on the nature of the Mosuo people and marriage system. Chapter 5 extends the debate from the realm of sociological studies to that of literary imagination. Using The Remote Country of Women (远方有个女儿国) as an example, Yang examines how its author Bai Hua (白桦), an acclaimed Han writer, questions the patriarchal state by unmasking the sensual, feminine ethnic borderland. It is here, Yang argues, that dominant Han culture finds its mirror image, or heterotopia, in the ethnic other. Chapter 6 studies how a highly controversial Mosuo woman, the sensational writer, performer, and fashion icon Yang Erche Namu (杨二车娜姆) offers up Mosuo traditions for mass cultural consumption. Namu became a spokeswoman for her people through her transnational journey of cultural negotiations. The chapter zooms in on the making of Namu’s hyper-feminine, hypersexualized public persona in her autobiographical writings, photographs, and public performances. These images and performances allowed Namu to self-orientalize her people and her culture; they also became the source of a national controversy by inspiring both moral judgements and cultural voyeurism. The book’s final section deals with another often-mystified Chinese borderland site, the Tibetan region. It tackles the myths of Shangri-La and the Buddhist pure land of Shambhala as they are imagined in literary works of the twentieth century. Exploring the globalized dimensions of the myths of Shangri-La, first made famous by James Hilton’s fictional epic Lost Horizon (1933), Yang looks into how Western utopian imaginings of Tibet are intertwined with a domestic search for China’s own indigenous utopia in the creation of Tibetan literary identities. Salient in this enterprise are the mystifying representations of Tibet’s Buddhist traditions and landscapes that make their way into literary works such as Tibetan author Tashi Dawa’s (扎西达娃) novella “Tibet, a Soul Knotted on a Leather Thong” (西藏，系在皮绳结上的魂) and Han writer He Ma’s (何马) serial fiction, The Tibetan Code (藏地密码). Yang critiques how some of the literary representations of Tibet and Tibetan regions lack substantial engagement with historical and cultural realities. By conjuring up religiously mythological images of a spiritualized land, writers perpetuate “metaphorical and symbolic concepts” of Shangri-la and Shambhala “based on [their] imaginative potential” (209). As a whole, Mystifying China’s Southwest Borderlands offers rich insights into how certain minority regions and cultures have been imagined in Chinese literature. 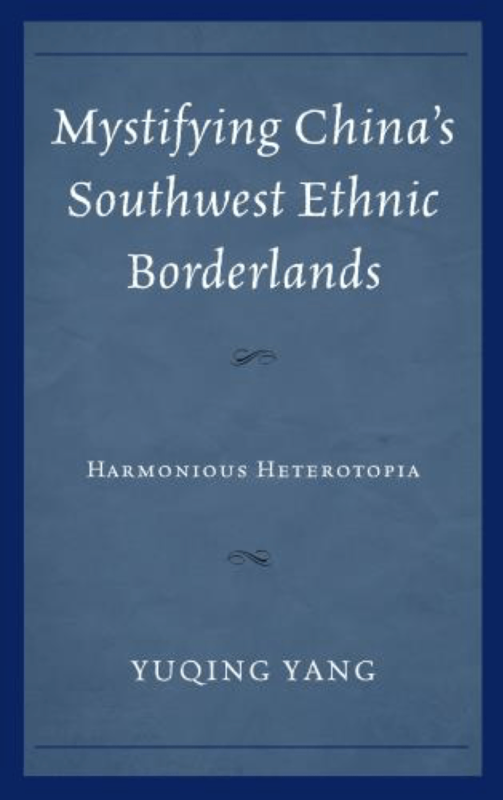 The author deftly develops and sustains her theory of harmonious heterotopia throughout the book. Analyzing a variety of literary and some non-literary texts related to minority peoples and cultures, the book refreshingly demonstrates how visions of a harmonious society can take heterogenous—sometimes contradictory—imaginary forms in China. The reader new to minority literatures would benefit at times from more textual details (such as quotations) and contextual grounding of the literary works analyzed. The book’s discussion of “feminine” borderland narratives and the sociological impulses of minority cultural representations would have benefitted from drawing upon gender and feminist theories and social sciences approaches. Nevertheless, the book as a whole is packed with sound literary analysis and is a praise-worthy project that enhances the scholarly understanding of ethnic minority literatures and cultures in China. Yanshuo Zhang is currently a Fellow/Lecturer in the Program in Writing and Rhetoric at Stanford University. Zhang completed her dissertation, Beyond Minority: Ethnicity, Modernity, and the Invention of the Qiang Identity in China, and received her PhD in Chinese Literature and Culture from Stanford University in 2018. Posted in Book reviews, Literature, MCLC, Society	Bookmark the permalink.